Here I am writing to you on Monday instead of Sunday which I promised myself solemnly I wouldn't do. But it is just as you say Sunday afternoon and evening are just as busy as other aftnernoons and evenings, our almost, and I never have time to get more than my one letter home written. Isn't it a shame? I have to give up almost every free minute I have to “rushing” and oh I do get so tired of it sometimes. There are some perfectly adorable girls here and two or three that I am simply crazy about, but other people think the same way and we are working oh so hard, for there are only four of us. But I heard a grand piece of news the other day and that was that one of the girls whom we want oh so much and whom we were so doubtful about said that she liked me better than anyone in the school! Wasn't that good news. We are tickled to death! Your little sister is doing some tall rushing. We have found out, at last just what Mr. Jay thinks of the sororities. He disapproves of sororities in general very much and, although he says he can see nothing harmful in these here, yet he doesn't want them here and will try to get rid of them in two or three years at least! But he told us that he wouldn't do anything this year and we are all relieved. But I can't blame him and I don't, because they could get harmful soeasily and so quickly. I wish they would all be done away with everywhere, don't you?I am so glad, dearie, that everything is still “serene” and that nothing has happened yet. I wish nothing would, because I do so want your Senior year to be as happy as can be! Dettydear, I do love you, love you, love you, and oh if I could only see you and hug you now! What a lovely house party that must have been and what a gruesome story you told me! I wish we could have a house party because they must be such fun!The chief excitement this week, was or rather last week, was the Hallowe'en masquerade ball. I went with another girl as Buster Brown and Mary Jane and we made ourselves the cutest costumes you ever saw. Mine was blue with a big blue tam-o' shanter and hers was white with pink ribbons. We looked perfectly dear and had the time of our lives. (Conceited, am I not?) The whole thing was a great success—for everybody's costume was dear and Mrs. Shib, our darling lady principal, whom we all love to death, had decorated the parlour for us and made it look perfectly beautiful with autumn leaves and pumpkins and large piles of apples. Your ever devoted little sisterNell. 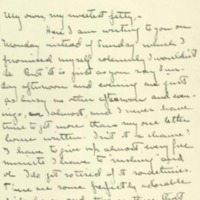 McAdoo, Eleanor Wilson, 1889-1967, “Eleanor Randolph Wilson McAdoo to Jessie Woodrow Wilson Sayre,” 1907 November 3, WWP17411, Jessie Wilson Sayre Correspondence, Woodrow Wilson Presidential Library & Museum, Staunton, Virginia.